The findings of a recent study on the use of epidurals during labor suggest the need to review current guidelines defining normal progression and potentially dangerous prolonged (abnormal) labor. Using the current guidelines, doctors may suggest medical interventions to speed the process when a little patience could be all that’s needed. The study indicates that the normal progression of healthy labor is lengthier today than it was in the 1950s when the current guidelines were established. The use of epidurals seems to lengthen the second stage of labor even further. Cheng and her research team examined the medical records of 42,268 women who, between 1976 and 2008, delivered vaginally without complication. About half of them got epidurals during second-stage labor. The research team compared the average length of second-stage labor — the pushing phase — in the group getting epidurals with those who did not. The team also compared the upper limit (lengthiest) of second-stage duration in both groups. Using the current guidelines issued by the American Congress of Obstetrics and Gynecologists (ACOG), 31% of the first-baby births fell into the abnormal (prolonged) classification, as did 19% of the deliveries involving subsequent babies. When labor is prolonged, complications to mother and baby can arise. An epidural is frequently administered to relieve maternal distress in an effort to ease the process. Other typical interventions include oxytocin to strengthen contractions, forceps or vacuum to aid delivery, or cesarean section (c-section) delivery. 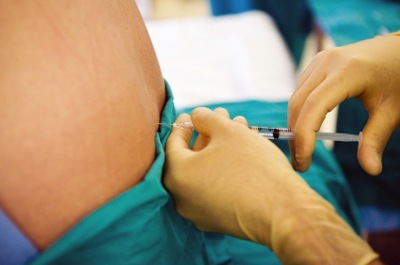 More than 3 hours for women giving birth for the first time, with epidural. More than 2 hours for first-time childbirth without epidural. As long as 2 hours for subsequent births with epidural. As long as one hour for subsequent births without epidural. As long as 5.6 hours for first births with epidural. As long as 3.3 hours for first births without epidural. As long 4.25 hours for subsequent births with epidural. As long as 1.35 hours for subsequent births without epidural. The USCF study strengthens the findings of previous studies that indicate the second stage of normal labor is longer today than it once was but the findings leave delivery-room doctors facing a dilemma. When labor is prolonged, the baby is more likely to have bruises on the head and even clavicle fractures can occur. Women were more likely to experience perineal tears and postpartum hemorrhage when labor is prolonged. More study seems to be in order to more clearly identify today’s fine line between normal and abnormal labor durations. “Saint Louis, Catherine. “Study Suggests Misplaced Fears in Longer Childbirths.” The New York Times / Health. The New York Times Company. Feb 5, 2014. Web. Feb 13, 2014. Cheng, Yvonne W., MD, PhD, et al. “Second Stage of Labor and Epidural Use: A Larger Effect Than Previously Suggested (abstract).” Obstetrics & Gynecology. American College of Obstetricians and Gynecologists / Lippincott Williams & Wilkins. Feb 4, 2014. Web. Feb 13, 2014.